Tandoori chicken is one of my favourite dishes to order at Indian restaurants and whilst looking for inspiration to jazz up some salmon fillets for dinner I thought I’d try doing them tandoori style. 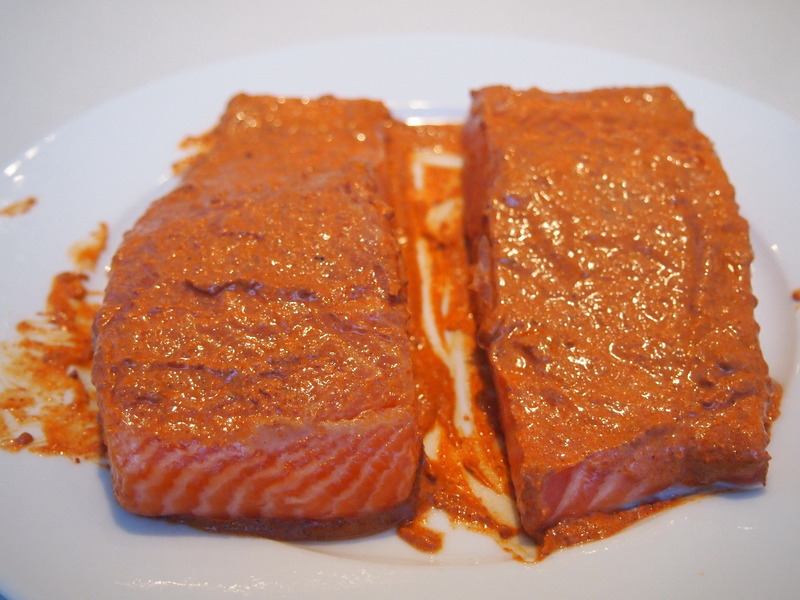 The salmon fillets were very easy to throw together thanks to Patak’s pre-made Tandoori Paste. 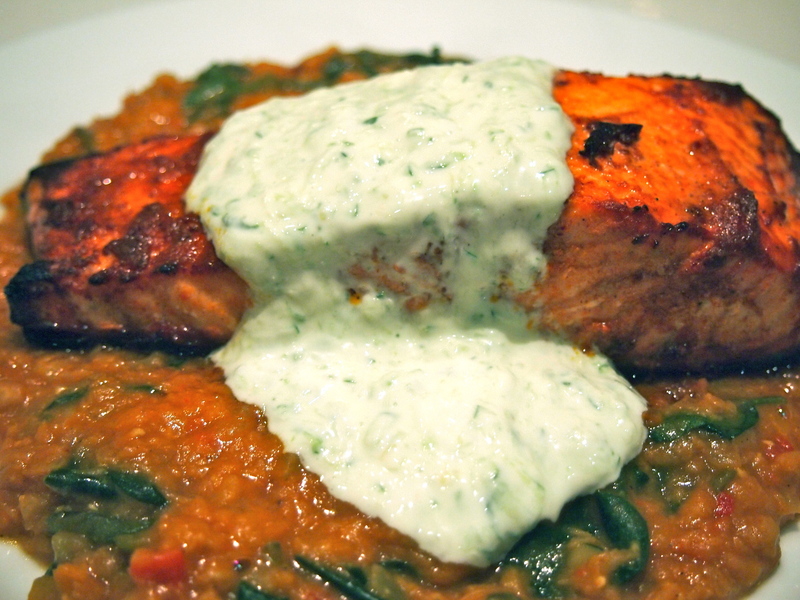 The dhal, whilst taking a bit longer to cook was still easy enough for a mid week meal and the topping of cucumber raita was a nice cooling contrast to the warm spices in the salmon and dhal. 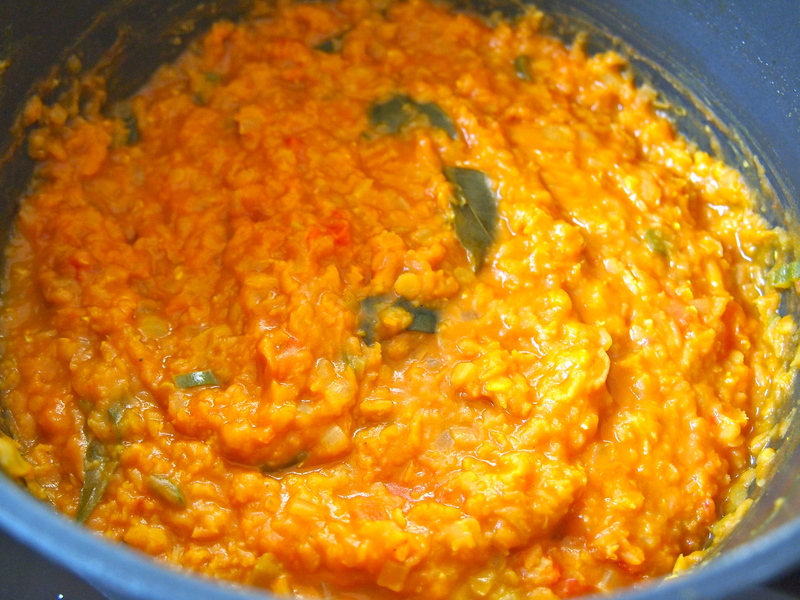 For the dhal, Heat the oil in a saucepan over medium heat. Once the oil is hot, add the onion, garlic and ginger. Stir often, until the onions are translucent. 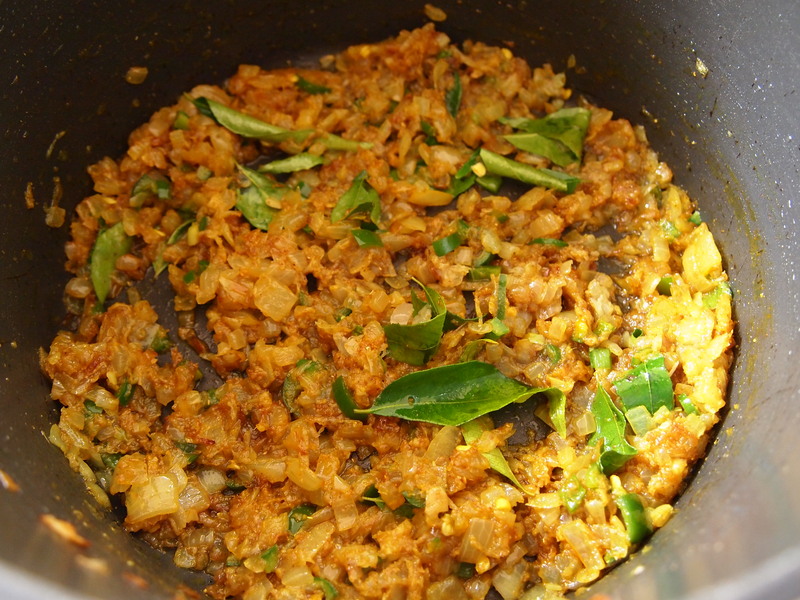 Add the curry leaves, green chilli and spices and stir for a few more minutes. 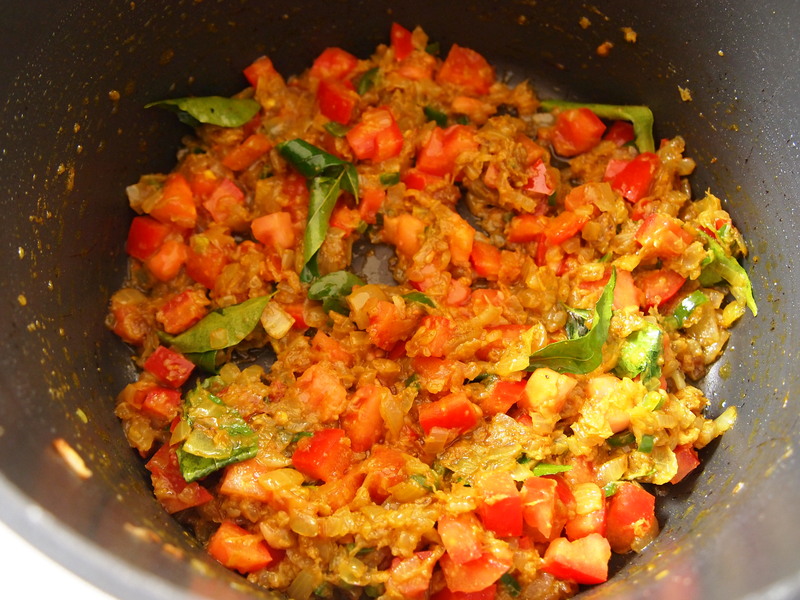 Add the chopped chopped tomato and cook for a further minute. Add the water and lentils and bring to the boil, then turn down the heat to low, cover and simmer for about 20 minutes, or until lentils are very tender and the water has nearly all evaporated. 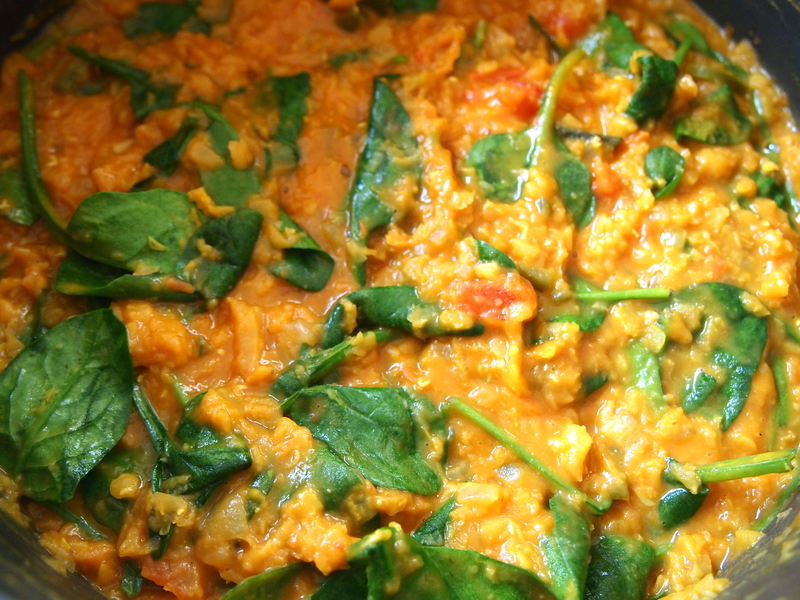 Once the lentils are tender stir in the tomato paste, spinach and salt until well combined. Cook for a couple more minutes for the spinach to wilt, check the seasoning and adjust if necessary. The lentils can be cooked ahead and reheated when required. For the Salmon, mix the tandoori paste, yogurt and lemon juice in a small bowl until well combined. Season the salmon fillets with salt and pepper on both sides and spoon the paste mixture over the salmon making sure all sides of the fillets are well coated. Leave to marinade for 15 minutes to an hour, depending on how much time you have. Preheat the oven to 200C and put a small amount of oil on a baking tray and place in the oven for a few minutes for the oil to heat up. Place the salmon fillets onto the warmed baking tray and place in the oven for 7 minutes. Remove and turn the salmon pieces over and cook for a further 7 minutes. Check the salmon and if the top hasn’t sufficiently crisped up place under the grill for a few more minutes. For the Raita, place all the ingredients in a bowl and mix until well combined. 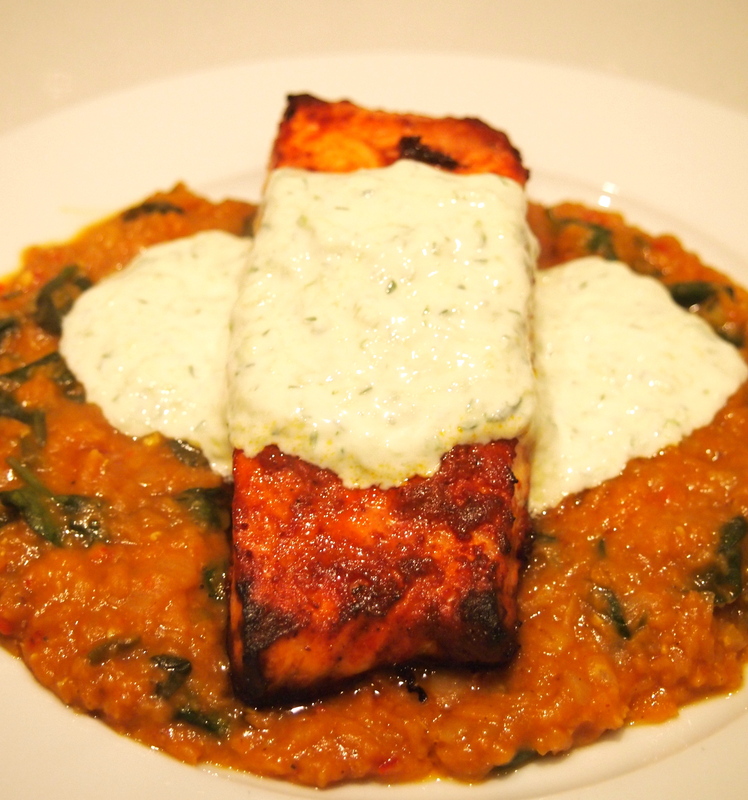 To serve, place some dhal on each plate and top with a salmon fillet then spoon some of the raita over the salmon.